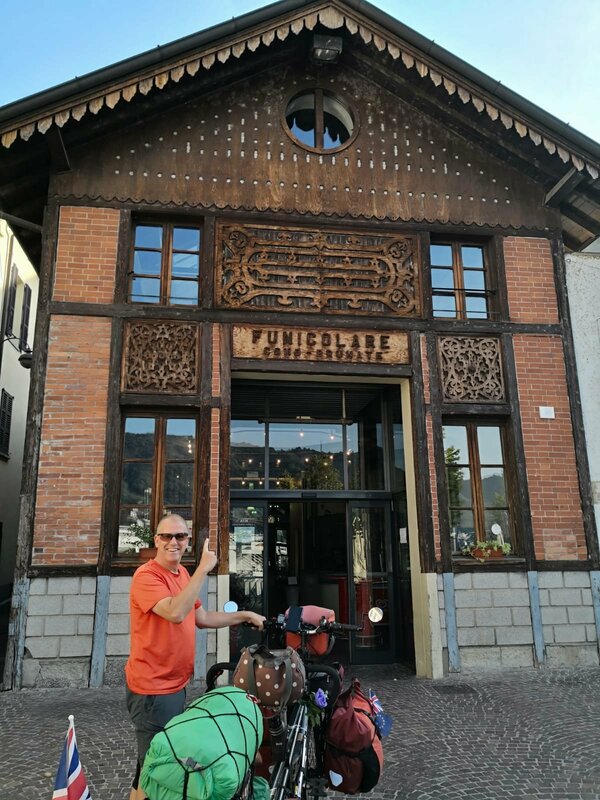 Home » 2018 - Switzerland and Italy » Leonardo was here…. I’m laying in bed writing this in the house previously owned by a Anna Magnani a famous Italian Film actress who coached Sophia Loren. It’s next door to the house Leonard De Vinci lived in and overlooks the Adda river from a high bank which is the last thing you want to see at the end of a cycle ride! The house itself looks like it hasn’t really changed since the films stars days and is full of dark wood furniture and paneling. Even the staircases have small steps to allow well dressed ladies not to trip over their skirts when using them. 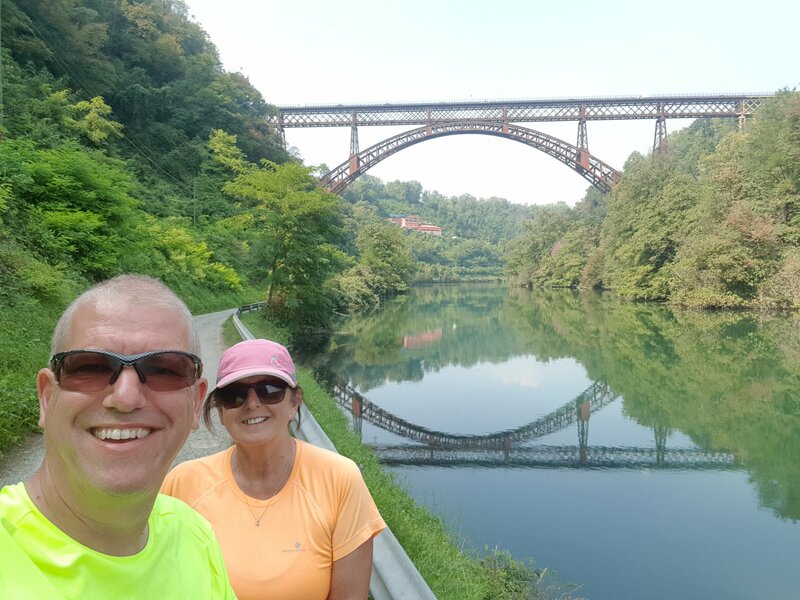 The day’s been full of history with us cycling down the Adda river and along a canal originally designed by Leonardo De Vinci to link Lake Como in the mountains and the plains in the south. It’s a breathtakingly beautiful ride and it took us all day to cover about 45 kms as we kept stopping and by the time we arrived at the film stars house we were suffering from History overload having also passed the castle where the Mona Lisa was painted. It was also our 30,000km on Tilly! But I’m getting ahead of myself! Back at the Gothard Pass for our first day of cycling we awoke and you couldnt see you hand in front of your face the cloud was so low. We breakfasted and got our winter gear on – it was very, very cold – and by the time Tilly was loaded and the onlookers had stopped taking photos of the mad English the clouds had begun to lift and you could clearly see the road and all the edges, falls and bends. Coming down the pass was hair raising for poor Linda who doesn’t like heights and edges at the best of times let alone when our brakes smell like they’re about to burst into flames but she bravely gritted her teeth as we descended the first 90 minutes very, very slowly without pedaling at all. Unlike our Rhine trip where we zoomed down the pass at over 50kph the Gothard is full of bends that should you approach too fast you’ll simply experience a very lightweight feeling before plunging a few hundred feet down the side of a mountain moments later. Needless to say Linda made it very clear to me that we were not going to take any chances going down so her wise words plus the cobbled road ensured we came down slightly slower than most of the lycra guys and gals were going up. By the time we reached the bottom stiff coffees were in order and Linda began to feel much calmer (caffeine is a wonderful pickup for Linda) and the blood started to return to her finger tips after having held on for dear life for so long. Mind you, the aluminium handlebar is permanently dented! The road continues to slope downward for around 40km after the main pass so we had a blast flying along on the now straight tarmac cycle paths along the side of the river drinking in the simply stunning scenery. Naturally we got those looks of amazement everywhere we went as our quarter of a tonne of Tilly, kit and us hurtled past on our way to our first campsite. Camping is supposed to be a cheap overnight alternative to a hotel, but the Swiss disagree with very expensive campsites and tiny spots for tents. So tiny that “The Pines” only just fitted on the pitch and our guy ropes intruded on all four adjacent pitches! 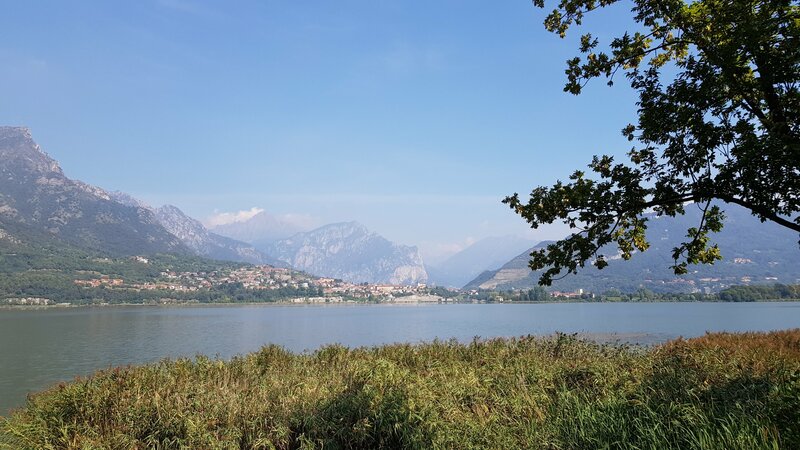 The views though were great by the lake and below the mountains but earplugs are essential as the motorways and railways all have to squeeze through the narrow gorges together. We actually love cycling in Switzerland. The paths are really well marked and usually a dedicated cycle path, the trains are cycle friendly, though not quite so a tandem friendly and the scenery is amazing. If you cycle the right route you can leisurely cycle, hill assisted for hours. But we were soon into Italy and immediately the cycle paths vanished and the roads became a patchwork quilt of potholes and patches. 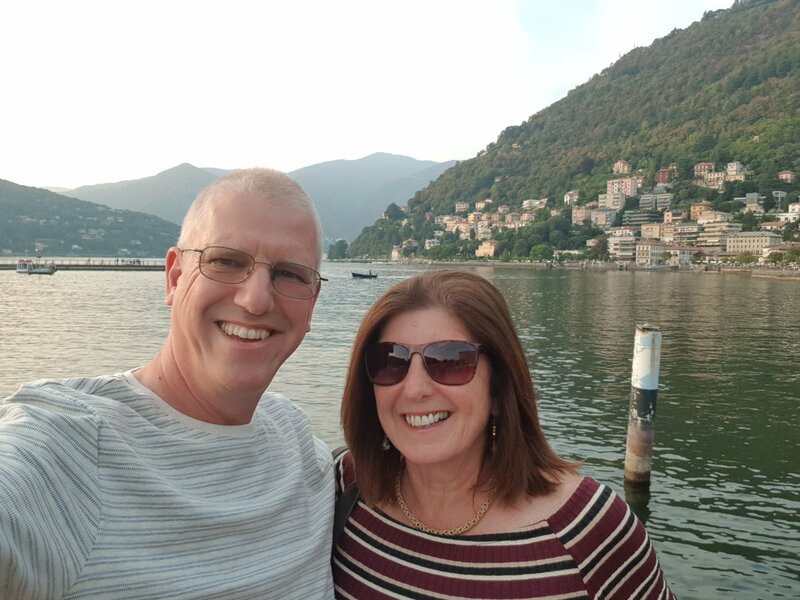 Fortunately they improved as we got away form the border and the lakes with Como and Lecco on are just gorgeous. 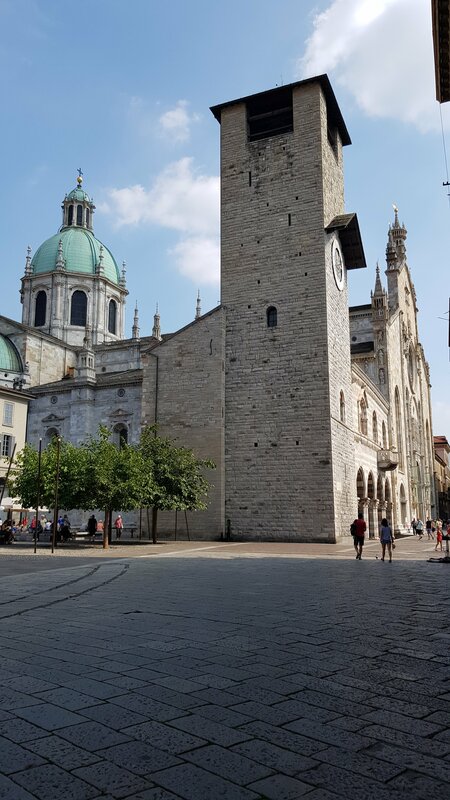 Camping is still expensive here and if you search around hotels can be found of ronly a few Euros more than a tiny patch of grass next to a motorway so when we arrived both at Como and Lecco we opted for staying right in the centre of the old towns and enjoying the old towns charm. 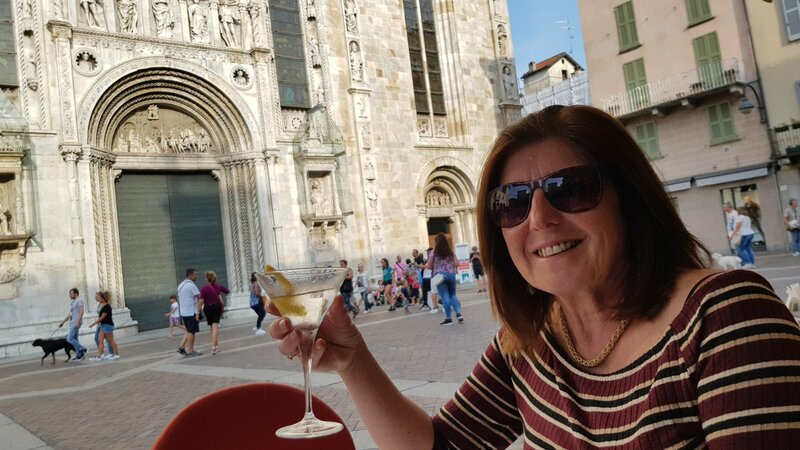 We loved our stays here and highly recommend this region for pedestrianised old towns with hundreds of gorgeous bars and restaurants. Mind you, they smoke like chimneys and the smell is all pervading and horrible. At Como we faced our last big hill so very sneakily persuaded the Furnicular Railway ticket office that Tilly and all our luggage would fit in no problem and took the easy option of railway up and roll down. Always the best option in my book. We’ve thoroughly enjoyed the cycling here and it just gets better and better with the ride through Leonardo’s canal / castle / house area just wonderful. 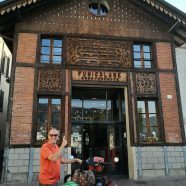 We had been warned at The Gothard Pass that Italy was poor and dirty. But this area is clean and seems quite developed and reasonably wealthy. It’s not at all how we remember the south of the country.